The Very Rev. Kenneth R. J. Hall, M. Phil. here with the kind permission of the Editor, Mr Denzil McDaniel. His motto in life is to be an encourager and to help people find hope and light in difficult times. This sentiment has been important for the new Dean of Clogher, the Very Rev. Kenny Hall, throughout his ministry but he also brings with him a message of reconciliation, tolerance and respect. Appointed as Dean of Clogher and rector of the Parish of Enniskillen at St. Macartin’s Cathedral in September 2010, Dean Hall has been getting used to his new surroundings. However he described his attendance at the recent memorial service in Enniskillen for Constable Ronan Kerr as one of his darker days since moving here from Tyrone. Ordained shortly before the Omagh bomb in 1998, Dean Hall explained how that dark period helped him to focus his ministry on encouragement and reconciliation. Recognising that reconciliation in Northern Ireland is a key issue, Dean Hall has spent years working to bring groups together. Following his studies in Theology, he completed a Masters degree in Philosophy of Reconciliation Studies and was a founder member of the Cookstown and District Clergy Forum, which reconciles groups throughout the province. This work also took him on fact-finding tours around the U.K. to places such as Coventry where he saw the scars of war and to Bradford where he met inter-faith groups. 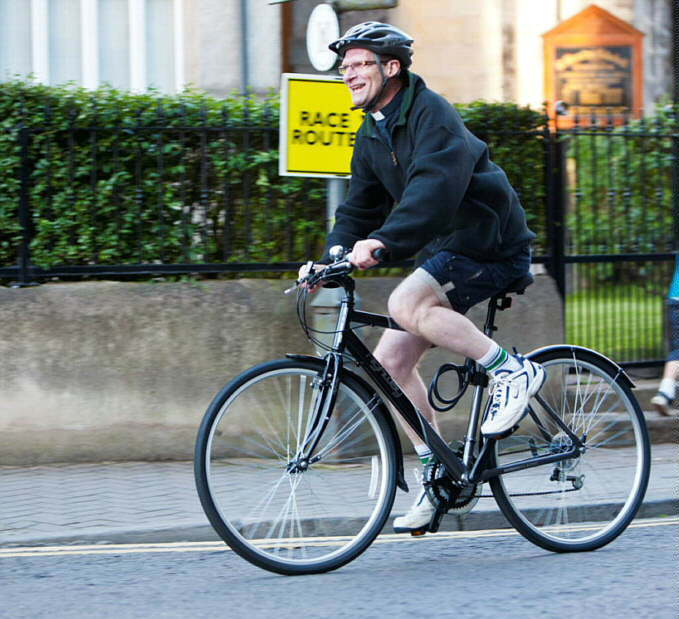 He said: “I am very involved in encouraging communities to come together. Differences make us what we are. The key to reconciliation is tolerance and respect for each other…We should treat all human beings as children of God, though we may not necessarily like what they do, but we should show them love and respect.” He continued: “I started to work in reconciliation in 1998, to try to build bridges, but it is still as difficult today as it was 13 years ago. 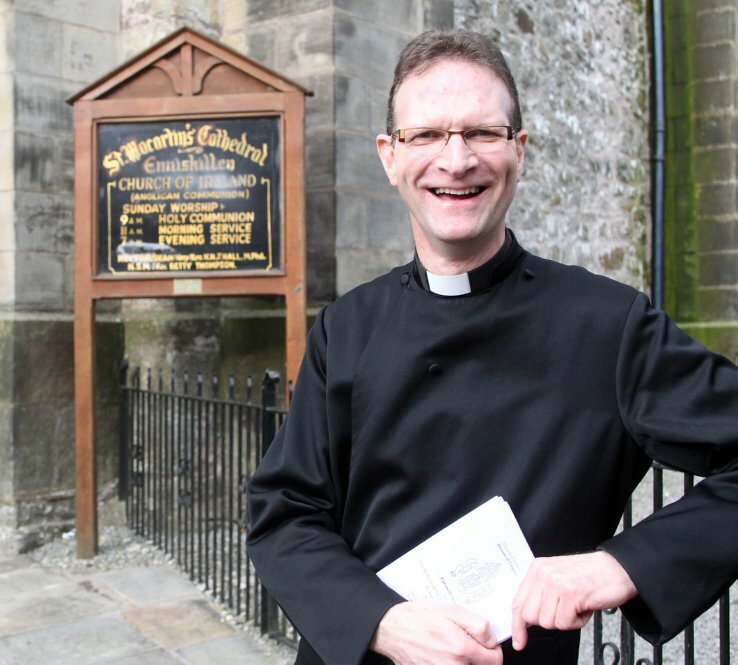 People are still divided.” Since relocating to the island town, he has become involved in the Fermanagh Churches Forum. As well as being rector of Enniskillen Cathedral and dean of the diocese, Dean Hall is also chaplain to the Erne Hospital, which he visits on a regular basis. He is married to Stephanie and they have three sons. Philip, aged 26 is employed as a doctor in the Royal Victoria Hospital, while Gary, 23 years old has completed his studies in Computers in Glasgow. Youngest son, Michael is finishing his A-levels at his father’s former school, Dungannon Royal School and also plans to go to university. The Dean - sweeter than he's ever been! 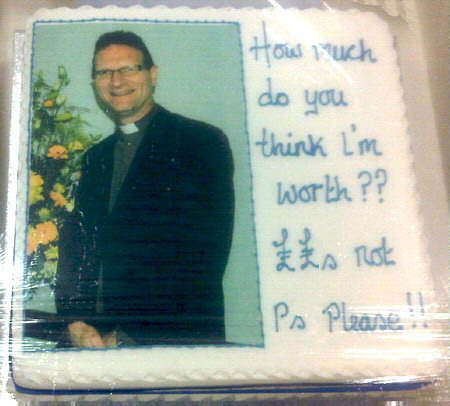 This shows a cake which was baked at Leslie's Bakery in order to be auctioned for church funds at our annual sale in November 2011. The Dean's image was captured in icing - a "first" for him - and it tasted good despite it! Scroll down to see an article about the Dean's visit to "the Palace" and also a photo of the Dean meeting a famous TV personality! The Very Rev. 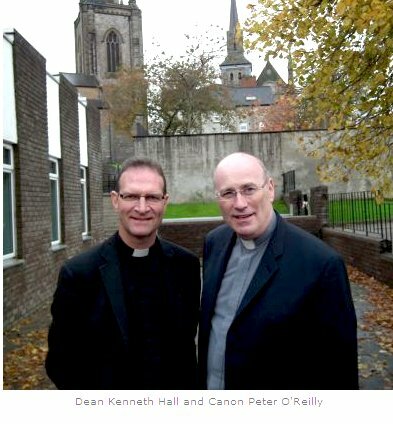 Canon Peter O'Reilly, Parish Priest of St Michael's Church Enniskillen, and the Very Rev. Kenneth Hall, Dean of Clogher and Rector of St Macartin's Cathedral Enniskillen, attended a reception in Buckingham Palace during the past week at the invitation of Her Majesty The Queen and the Duke of Edinburgh. The reception was for those who helped organise various events to mark the Queen's Diamond Jubilee included a number of celebrities, such as Gary Barlow, who had contributed to the festivities of the Diamond Jubilee weekend itself. Canon O'Reilly and Dean Hall were invited as co-hosts of the Northern Ireland State Service of Thanksgiving to mark the Queen's Diamond Jubilee, which took place in St. Macartin's Cathedral in June and was followed by a reception in St. Michael's Church. community relations that many have wanted to follow but have not had the confidence to do freely in the past. The Queen's visit to Enniskillen had provided a glimpse of the future, one where people can be together, not necessarily be the same, but together in peace and harmony. They also had the opportunity to talk to other members of the Royal Family, including the Duke of Edinburgh, the Duke of York and the Princesses Beatrice and Eugenie. During their time in London, the clergymen were followed by an ITN film crew in preparation for a two-part series covering the Queen's Diamond Jubilee. They had previously been interviewed for the programme when the Queen and Prince Phillip visited Enniskillen in June. 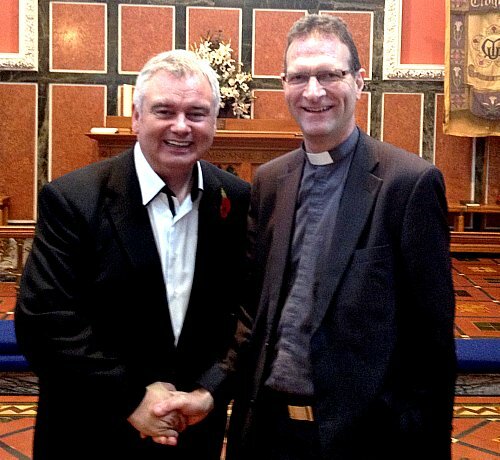 The Dean meets TV personality Eamonn Holmes (NOT related to our webmaster!) who was in Enniskillen in October for the recording in the cathedral of two "Songs of Praise" programmes in which the latter acted as presenter.